Situated 30kms north of Kerikeri and the Bay of Islands, in Whangaroa County, Matauri Bay is one of the most beautiful places in Aotearoa, New Zealand. Matauri Bay's sheltered white sand beaches and crystal clear waters have long made this a favourite aquatic playground, popular for beachfront camping, swimming, snorkeling, water sports, horse trails, or just wandering along the beach. The rocks around Matauri Bay offer bountiful diving and fishing opportunities. On an easterly or south easterly swell at high tide, Matauri Bay can produce excellent surfing. There is safe launching for your boat to venture out to the Cavalli Islands, where the fishing and diving is world class. From the hills surrounding Matauri Bay, there are panoramic views to the nearby Cavalli Islands. This panorama, seen when approaching Matauri Bay by road, has long been known as “the million dollar view”. Well worth the drive in itself, this view gives a hint of the treasures to be found on this sublime stretch of Far North coast. Before descending to Matauri Bay, the road branches. At this crossroads is the Matauri Bay Top Shop, a grocery store and licensed cafe. As well as supplying refreshments, the shop provides a great vantage point over this iconic Northland view. 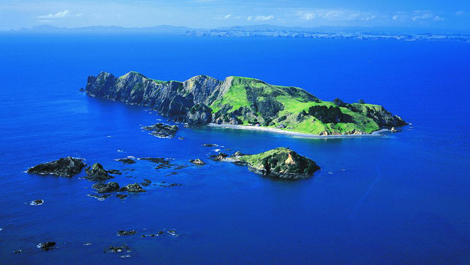 Matauri Bay is the place where Reverend Samuel Marsden made his first landfall in New Zealand. Samuel Marsden was an English missionary to New Zealand where he was the first to present the gospel to the Maori. The 20th of December, 1814 at Putataua Bay in Matauri Bay, saw the arrival from Sydney, Australia of the Reverend Samuel Marsden, aboard the Church Missionary Society's brig 'The Active'. Accompanying Marsden were missionaries Thomas Kendall, William Hall and John King and their families; John Liddiard Nicholas (author of “Narrative of a Voyage to New Zealand”) and Ruatara, Hongi Hika, Korokoro, Te Nganga, Tui and Maui. John Nicholas noted "on reaching the beach in the longboat, the savage warriors of about one hundred and fifty in number, were on a hill that rose in a conical shape to a considerable height. Few were under 6ft tall, with determined faces and firm martial bearings, some had the teeth of their enemies slain in battle hung from their ears". The great Ngapuhi war chief, Hongi Hika welcomed Marsden and his colleagues with haka (war dances), inviting them to a feast. They spent the night with Hongi Hika and his people at Putataua Bay before continuing to Rangihoua in the Bay of Islands to establish the first mission station. 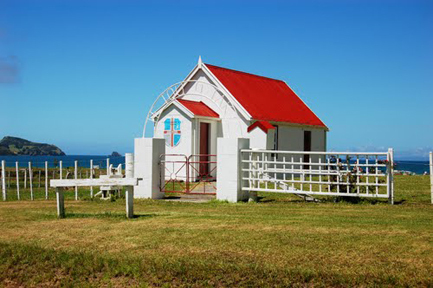 The small Anglican church beside the road, some 400 metres before the beach, is the Samuel Marsden Memorial Church, named in honour of the missionary's arrival on these shores. The lettering above the gate to the churchyard and urupa (cemetery) reads “Te Tou O Taki”. A highlight of Matauri Bay is Mataatua Puhi, a Maori waka taua (war canoe) built to commemorate the great Pacific migration that brought the Maori people to New Zealand. Mataatua Puhi was launched in 1990 and is 21.8m in length with a 1.5m beam and can carry up to 36 paddlers. Mataatua Puhi is housed in an open sided waka whare (canoe house) next to the camping ground at the northern end of the main beach at Matauri Bay. The Tepene tablelands are an area to the south of Matauri Bay. Ancient geo-thermal activity and the locality's unique soil conditions have conjoined to form the whitest clay in the world. This clay is used to produce the highest quality porcelain and bone china with outstanding strength and translucency. New Zealand China Clays Ltd extracts, purifies and exports this clay around the world to the most demanding manufacturers of the finest porcelain and china creations, from delicate tabletop collections to exceptionally tough hotel-ware. The Cavalli Islands lie 3km north-east of Matauri Bay on Northland's east coast near Whangaroa and are a small group of mostly* uninhabited islands (*one of the islands, Motukawaiti, is home to the Cavalli Island Retreat & Spa - a luxury boutique hotel). Captain James Cook named this group of islands on his first voyage to New Zealand. Cook's ship, HMS Endeavour, passed between the Cavalli Islands and the mainland coast on 27th November 1769, where after becoming becalmed, she anchored at one of the many sheltered bays nearby. Several canoes visited the ship at anchor and Cook and his crew exchanged items with local Maori for freshly-caught fish. Cook wrote in his journal: "during this time several canoes came off to the ship and two or three of them sold us some fish, Cavelles they were named, which occasioned my giving the island the same name". It is assumed that the fish that were traded with Cook were Trevally, but the name Cavalli has remained. The Cavallis are the final resting place of the Rainbow Warrior, which is one of the top dive sights in Northland. The coastal area nearby and the islands themselves offer many secluded beautiful beaches - spend a day swimming, snorkeling, fishing or relaxing in this subtropical paradise. The Cavalli Islands can be reached by boat, and in good weather you can kayak to them. This stunning island is a little-visited gem, and is well worth exploring. Motukawanui Island, known locally as simply Motukawa, is the largest island in the Cavalli group and is a nature reserve. The historic Motukawanui Scenic Reserve is a popular attraction on Motukawanui Island with a walking track and a basic accommodation hut that sleeps up to 12. Farmed until 1974, today Motukawa is under the care of the Department of Conservation. Camping is not permitted on the island, however the Motukawanui Hut offers basic amenities and is available to rent. Contact the local DoC headquarters in Kerikeri for bookings: DoC Kerikeri. Bombed by French government saboteurs in Auckland harbour in July 1985, the Greenpeace ship Rainbow Warrior was later re-floated and scuttled off Matauri Bay. The Rainbow Warrior was a former UK Ministry of Agriculture, Fisheries and Food trawler, later purchased by the environmental organisation Greenpeace. The ship was active in supporting a number of Greenpeace protest activities against seal hunting, whaling and nuclear weapons testing during the late 1970s and early 1980s. She was sunk on 10 July 1985 whilst moored in Auckland harbour by operatives of the French intelligence service, to prevent her from interfering in a nuclear test in Moruroa. Fernando Pereira, a photographer, drowned on the sinking ship. Two French agents were later arrested by the New Zealand Police and charged with murder and terrorism offenses. Today the wreck is a complex marine eco-system covered in colourful corals and populated by goatfish, moray eels and other fish. Anemones, sponges and algae of all hues cling to the wreck; in its watery grave the Rainbow Warrior is far more rainbow than warrior. She rests just under 6 km north of Matauri Bay, 350m south of the pass between the 2 small islands, Horonui and Motutapere at GPS co-ordinates 34º58.60'S 173º56.14'E. 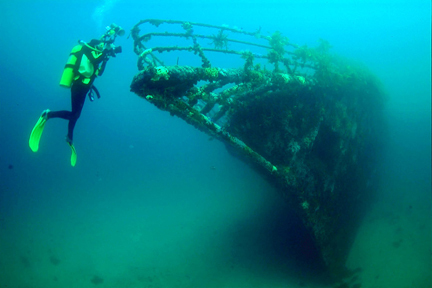 40m in length and lying almost upright on the sandy bottom, the wreck can easily be covered in a single dive. Its superstructure rises to within 50 ft (15 m) of the surface, with the seabed below at 85 ft (26 m). Its bow section is still largely intact, creating the illusion that it is sailing across the white sands of the seafloor beneath its hull. The UK's Daily Telegraph newspaper named it as one of the top ten dive sites in the world. Dive trips to the wreck run throughout the year and visibility is usually excellent. The prominent headland at the northern end of the main beach at Matauri Bay is called Pukepika. A signposted walking track inside the camping grounds leads to the plateau on the summit of Pukepika and affords spectacular views over the channel between the mainland and Motukawanui Island - the largest island of the Cavalli group. In the stretch of water to the north lies the Rainbow Warrior, brought up from Auckland and scuttled here to provide an artificial reef for sea life and an attraction for divers. To commemorate all who sailed in the Rainbow Warrior, local hapu (sub-tribe) Ngati Kura and New Zealand China Clays Ltd commissioned a sculpture for this site. 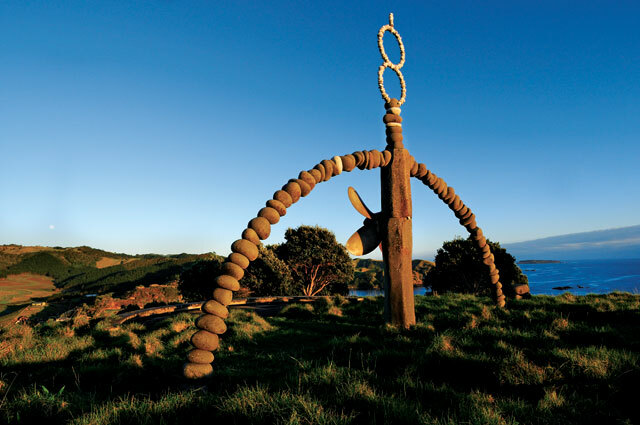 Between 1988 and 1990, internationally-acclaimed Kerikeri sculptor, Chris Booth, created a large-scale work comprising an arch of rocks and basalt pillars, all brought from the nearby rocky shore at Piakoa, 6 km to the south. To avoid any disturbance to sea life, all the rocks used in the sculpture were removed, with much difficulty, from above the high water mark. The 66 large round basalt boulders that form the 10 metre arch weigh almost ½ a tonne each. The main stone of the central basalt column weighs 6 tonnes. It supports a smaller 4 tonne basalt column and between these 2 great stones is the dented bronze propellor from the sabotaged Greenpeace ship. A large flat boulder inscribed with a map indicates the ship's final resting place, 6 km to the north.